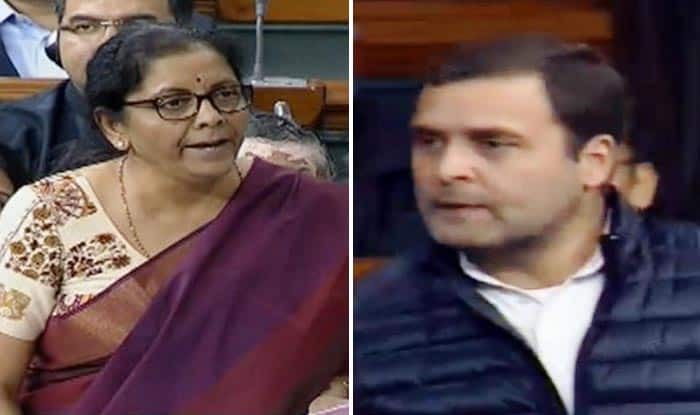 Defence Minister Nirmala Sitharaman took the Congress head-on in Lok Sabha on Friday over allegations levelled in connection with the Rafale deal and said that the Opposition is scared of facts. “I don’t have a ‘khandan’ to boast on. PM also comes from a poor background. He has come here from hard work. I have my honour intact. PM has his honour intact. We have all come from normal backgrounds,” she said amid ruckus in Parliament. Earlier, the Congress president Rahul Gandhi in response to Sitharaman’s statement in Lok Sabha said, “I am not accusing you or Manohar Parrikar. I am accusing Narendra Modi.” He asserted that the Congress has a proof that the Prime Minister is involved in Rafale scam. “French President Macron said that ‘Price is not a part of the secret pact, and you are welcome to say this publicly.’ There was another statement by ex-president Hollande, and he stated that Mr Anil Ambani’s name was provided to me by the Prime Minister of India and the government of India,” he added further. The Defence Minister took the Congress head-on in Lok Sabha, earlier in the day, over the allegations in connection with the Rafale deal and said that the Opposition is scared of facts. “We did not mislead the Supreme Court. Rahul Gandhi is misleading the nation,” she said while replying to Congress president’s accusation against the Centre. “You are misleading the country by saying the NDA government reduced 126 Rafale jets to 36. Congress was supposed to buy 18 in fly-away condition, the NDA raised that to 36,” she said. “CAG is conducting performance audit of capital acquisition of air systems including the 36 Rafale. Complete draft audit report has been received in Ministry of Defence in December 2018. Response is under preparation,” the Defence Minister said. “For five years, Defence Ministry has run without dalals under Modi ji,” she added while asserting that Rafale is not a scam. “Rafale deal is a decision taken in national interest,” she said while claiming that Bofors was a scam which brought down the UPA government. “Rafale will bring Modi back for the betterment of India,” she said. Referring to negotiations of the Rafale deal during the rule of Congress-led UPA, the Minister said, “You stopped the deal, forgetting Air Force was suffering. “You didn’t conclude the deal, because it didn’t suit you. The deal didn’t get you money,” she alleged. Countering the Congress’ charge, she said that it was the Indian Air Force which suggested that the government buy two squadrons or 36 Rafale jets in fly-away condition instead of 18, as was planned to be purchased under the Congress-led UPA government. She accused the Congress of compromising with national security in the interest of the party’s “treasury” while deciding on buying 126 fighter jets. The minister informed the house, that the delivery of first Rafale, under the deal finalised by the NDA government, will happen in 2019, while the last of 36 jets will be delivered in 2022. With regard to pricing difference, Sitharaman said there was no formal price noting by the Congress of Rs 526 crore as the deal price. But the price negotiated by the NDA government is nine per cent lower than what was negotiated by UPA.